A Hindoo Temple, near the Railway Station at Bycullah [Bombay]. bl.uk > Online Gallery Home	> Online exhibitions	> Asia, Pacific and Africa Collections	> A Hindoo Temple, near the Railway Station at Bycullah [Bombay]. Photograph from 'Views in the island of Bombay' by Charles Scott,1850s. 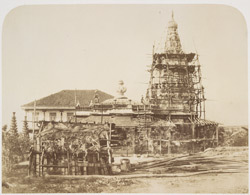 This is a general view of a view of a temple, with tower swathed in wooden scaffolding, near the railway station at Byculla. Bombay by the 14th century was controlled by the Gujarat Sultanate who ceded it to the Portuguese in the 16th century. In 1661 it was part of the dowry brought to Charles II of England when he married the Portuguese princess Catherine of Braganza. In the 19th century, with their empire in India established, the British built grand buildings as outward manifestations of their power and legitimacy as rulers. Bombay boasts numerous examples of colonial architecture.